Gatorade got its start at the University of Florida. The school's location in a hot subtropical climate combined with strenuous workouts left the players exhausted and unable to play to their capacity. After researching why the players had so little stamina in the Florida heat, university doctors came up with a solution: a drink that replaced lost fluids and minerals. Turning Gatorade into a slushy makes it even more refreshing in hot weather. Unlike bottled water, Gatorade and other sports drinks contain a host of ingredients that can settle to the bottom of the container. Sodium and potassium replace electrolytes you lose during a workout. While these ingredients generally remain invisibly mixed with the drink's fluid component, a long wait on the shelf can cause them to precipitate out of solution. Give the bottle a shake before making your slushy. Although you could freeze your sports drink in the plastic container, getting to it after it's reached a semi-frozen, slushy state would be a challenge. Instead, pour the Gatorade into a shallow container such as a large rectangular cake pan. Using a shallow container allows the liquid freeze more quickly and evenly. You will also have an easier time stirring it to give it the proper slushy consistency and keep it from freezing solid. Pure water freezes at 32 degrees Fahrenheit, but water with impurities -- scientifically speaking, those flavors, colors and sweeteners are impurities -- has a lower freezing point. That's the case with Gatorade, so make sure your freezer is set lower than 32 degrees Fahrenheit or your drink won't freeze into a slushy. How long the liquid takes to freeze depends on the temperature of your freezer, the size of your container and the quantity of Gatorade you're freezing, so check it periodically to ensure it doesn't freeze solid. After the first hour of freezing the Gatorade, stir the liquid with a whisk or fork to break up the ice crystals in it. If left undisturbed, the drink will form larger ice crystals that aren't right for the smooth, airy consistency of a slushy. Return the Gatorade to the freezer after stirring and check it every half hour to hour, mixing it with the fork or whisk each time. When the drink reaches the proper consistency, scrape it with the fork or whisk to produce a semi-solid frozen treat. 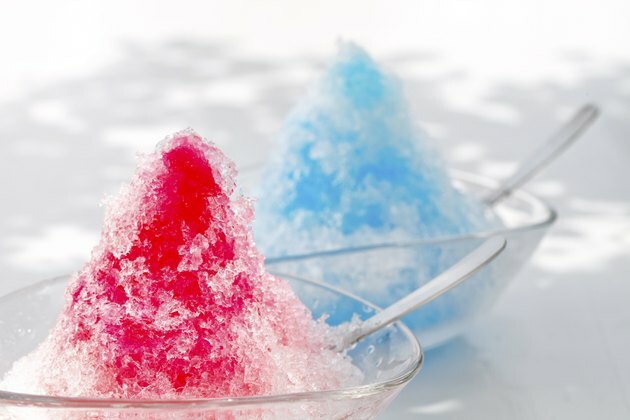 You can also pop the slushy drink in a blender and whirl it briefly to produce a smoother consistency. While a pure Gatorade slushy has the most intense flavor, you can also create quicker slushies with ice and Gatorade in a blender. The ice dilutes the Gatorade, but you can enjoy this slushy immediately instead of having to wait for the drink to freeze. You can also pour Gatorade into an ice cube tray and blend the cubes with enough water to make a slurry.